The Brigands be a musical minded group, performing songs, Sea Shanties and tunes, lore and fact, from the Golden Age of Piracy, 1650-1750 and beyond. Music was critical to the sailing of wooden vessels. It kept the hands working and pulling in unison, through storm and wind and calm. The Brigands bring the music from the deck of HMS Hellion ashore for you to enjoy. A bit rowdy, a bit naughty, always fun and sure to get your blood pumping. Thrill to the calls for “All hands to make sail. Trice up and lay out! “. 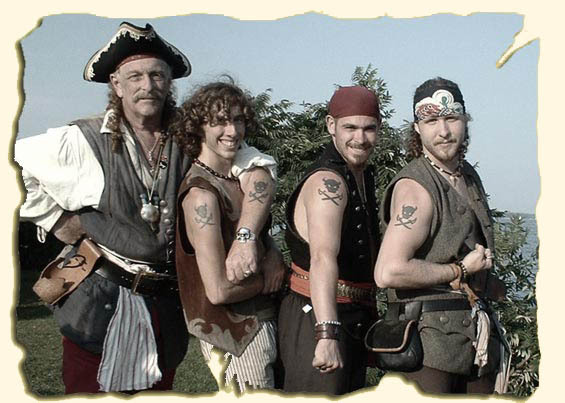 The Brigands have been called the ultimate pirate band, music that could have been heard in any dockside tavern, where sailors, pirates, buccaneers and privateers all came, to spend their hard earned ( or ill gotten) money, drinking and singing the songs of the era. The Brigands also perform a full Black Powder cannon and small arms demonstration, showing audiences the main weapons that pirates used to become the best known pre-emptive marine salvage experts in the world. The Brigands demonstrate flintlock pistols, muskets and of course, our Beloved Cannons! Feb 27, 2016, The Brigands will release our 8th CD, titled “Spanker in the Aft” a collection of both traditional and original tunes and songs, done in the infamous Brigands manner – loud , lively and a bit raunchy. Release party is at the Pirates 6th Salty Ball ! Feb 5,2014 – Coming on March 1, 2014, The Brigands 7th CD of pirate music, “WELL HUNG”. Our most ambitious, darkest album yet, the release party will be at the Pirates 4th Salty Ball on March 1st. After that it will be available here thru our store, or at our performances. 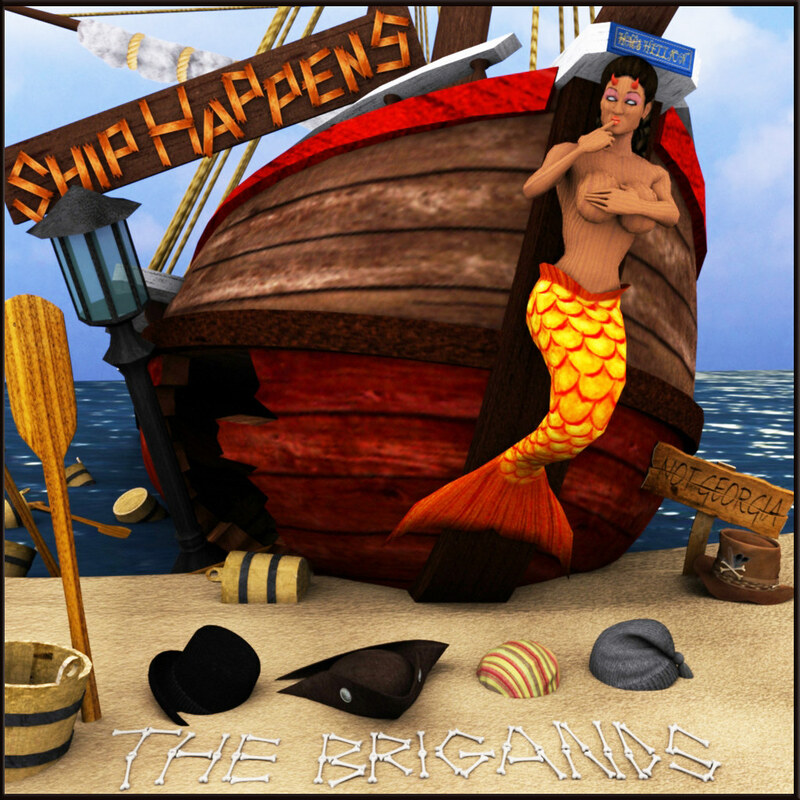 2/11/2012 – The Brigands release our 6th CD, “SHIP HAPPENS”. Two years in the makin’, with a hold full of mayhem, tunes and songs. From the title track, “Ship Happens” to the lively ”Un-dead Sailor’s Hornpipe” to Doug Mackean’s haunting ” The Gael” (Last of the Mohicans), there are 21 songs of some of our best music to date. We hope everyone has as much fun listening to it as we had recording it ! 2011 – The Brigands celebrate their 10th year together – 10 years of music before the mast – come and help us make merry at a Festival or Faire near you !!!! The Brigands are pleased to announce the release of their 5th CD, titled “Inner Buccaneer“. Some of the tunes include “Hard Pressed” written by Kevin ‘Dozer’ McQueen; “The Squall” written by Bloody Bill Marley; “Crimson Tide” written by Butch ‘Boom Boom’ Cannon and several original fiddle tunes written by the good Captain, along with many period songs and tunes from the Golden Age of Piracy and beyond!